“My boyfriend and this interesting tree serve as my points of interest for this photo taken on the St. Croix River on the border of Maine and Canada. I “painted” the subjects with light from my headlamp.” Tokina 10-17mm fisheye lens set at 10mm and f3.5; ISO 1600; shutter speed 30 seconds. Body: A camera that allows you to control the shutter speed, most often this is a DSLR camera. Lens: A wide-angle lens that preferably stops down to at least f2.8. I use a Rokinon 14mm f2.8. Tripod: Any tripod will do. If you are in the backcountry and weight is an issue, get a travel tripod or take a beanbag. You can even rest your camera on rocks. Remote Shutter Release: This is not absolutely necessary, but it makes things much easier. When you press the shutter on your camera there is always a little bit of camera shake, which makes for a blurry image when using a long shutter speed. I use a wireless shutter release to alleviate this issue. Another option is to set your camera on the two-second timer so the shutter doesn’t open until you’ve had time to take your hand away from the camera. 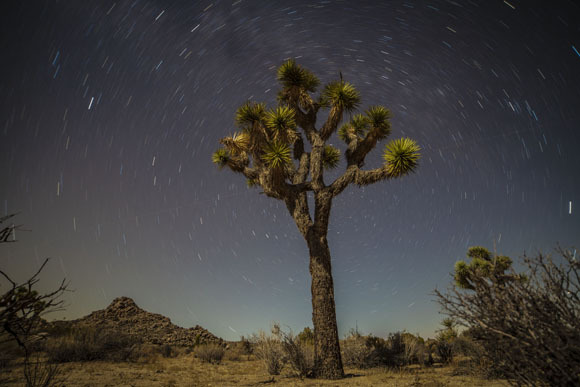 “There was a half moon behind the camera and it effectively lit the entire scene in Joshua Tree National Park. If I were to leave the shutter open much longer the sky would have been over exposed.” 8-minute exposure at f2.8; ISO 1000 taken at14mm. Just like taking a regular photo, when setting up a night sky shot you want to create interest within the frame. It’s ideal to have a foreground, middle ground, and background. Think of composition and points of interest just as you would any other photo. 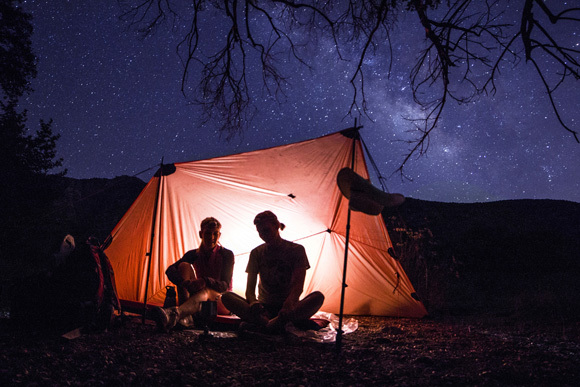 For instance, place a person, tent, or tree in the foreground, silhouetted mountains make up the middle ground, and then a starry sky will be the background. There are three parts to exposure: ISO, shutter speed, and aperture. All are subject to the conditions in which you are shooting. If there is a full moon, your settings will be different than if there is a new moon. Typically, if I’m shooting stars I try to shoot during a new moon. My ISO is usually set at 1600, the aperture at f2.8, and shutter speed can range anywhere from a few seconds to a half hour. “I triggered the shutter with a remote in my hand to take this photo of a friend and I camping in the Cleveland National Forest. My boyfriend was holding a small flashlight behind the tarp to highlight the orange color of the tarp against the deep blue of the sky.” 30-second exposure at f2.8; ISO 1600 taken at14mm. Stars: There are two distinct types of star photography, star trails and star points. Stars trails are taken by using a long exposure, typically anywhere from a 45-second exposure and up. This will create star trails, or streaks, because of the rotation of the earth. Many photographers use Photoshop layering techniques to create noise-free star trails that connect in a circle. However, this can be achieved (noise included) in a single exposure with a shutter speed of 15 minutes to half an hour (in some cases longer). It’s common practice to find Polaris, or the “North Star,” in order to pinpoint the axis the Earth rotates around. When shooting toward Polaris the star trails form a circle in the sky. When capturing star points the resulting photograph looks more like how we see the stars with our naked eye. Most often photographers locate the Milky Way and capture it over points of interest. “This type of lightning is called intra-cloud lighting and as the name suggests, the lightning travels from cloud to cloud without striking the ground.” Fisheye lens, 14-second exposure at f6.3; ISO 100 taken at 10mm. Lightning: Shooting lightning is one of my absolute favorite forms of photography. It is exciting, difficult, and can potentially be dangerous. Keep your distance from the storm and shoot it before it is over your location or after it passes. The aperture may be set anywhere between f2.8 and f11 depending on brightness of the flash. Likewise, your ISO could range from 100 to 1600 depending on the brightness and frequency of lightning flashes. 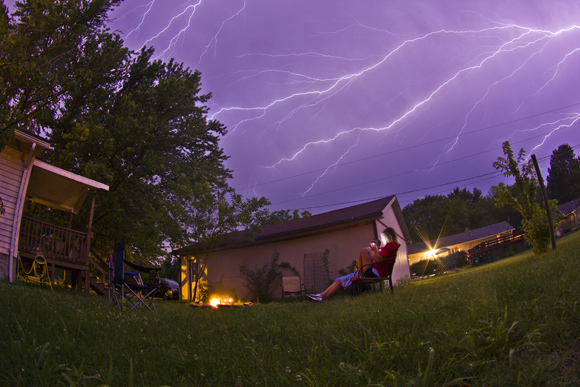 Use a remote shutter release to begin an exposure and close the shutter immediately after lightning strikes. Leaving the shutter open for a longer period of time will likely cause an overexposure. Aurora borealis: I have only had the opportunity to shoot the Aurora borealis or “Northern Lights” once, several years ago when I owned an old DSLR and only a kit lens. 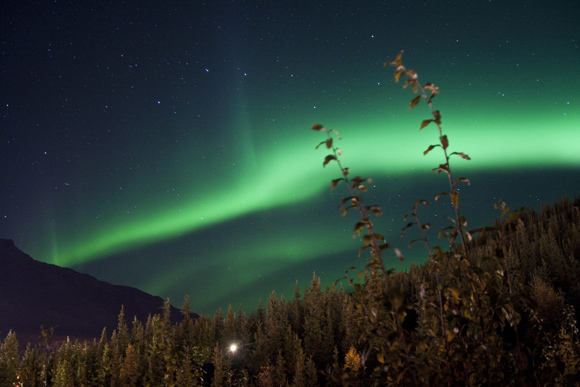 Most of the above information applies to shooting the Aurora, however more light emanates from the sky for a longer period of time than either of the above situations. A 30-second shutter speed and some point of interest other than the lights will make for an epic photo. “I sat in my sleeping bag with a friend just outside of Denali National Park in Alaska to capture this shot of the Aurora borealis.” 30-second exposure at f3.5; ISO 800 taken at 18mm. 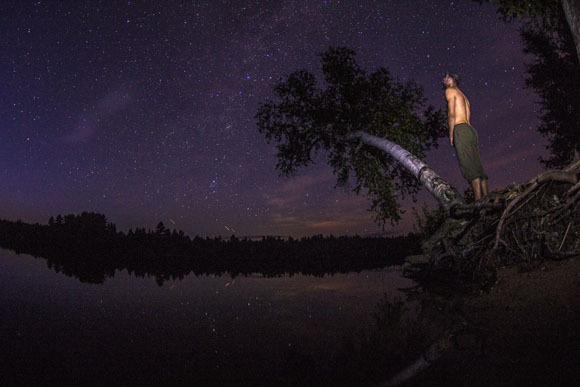 Show us your night photography by tagging us on Instagram @Teva #teva. You could be featured on our blog!